A while back I had to write a bio for myself, not the easiest thing to do and recently those very words came up in conversation with my hubby. I had written “Sarah dreams of a world where dairy free ice cream is on every restaurant menu” and the other day I was thinking my goal no longer feels like a dream it’s starting to become a reality. For too many years when I went out for a meal I watched everyone else eat dessert whilst I missed out but more recently, depending on the location of course, I get to join in. Thanks to the rise in Veganism and the power of Twitter I’m discovering local destinations that are bringing on board dedicated Vegan menus and one such place is The White Hart in Pirbright. No longer do you have to ask for alterations to your meal, these are dishes you can order straight off the menu. Before I get started on the food as a side note and admittedly it might be our own social awkwardness, we hadn’t understood the restaurant/bar arrangement. I’d last visited the pub a number of years back so have a memory of sitting out in the beer garden. We’d walked into the pub through the main doors, spotted a table with menus and board saying to order from the bar. We’d sat down in the area to the left of the building which turns out is dedicated as a restaurant with table service. Hubby went to order drinks at the bar and then I overheard him getting a “telling off” for where we were sitting. We’d assumed Saturday lunchtime might be busy so had in fact booked a table ahead of our visit so by accident we were sitting in the correct place. Maybe it’s just me but a friendly face on arrival to greet people and assist them might have been useful for those of us who are not familiar with the venue. I find it’s a very British expectation to assume we all understand pub etiquettes for food service. We’re gotten it wrong before, I recall another local where we wandered in, sat down and were fiercely told the venue was reservations only. It’s a learning curve these unwritten pub rules. Let me get back to the main reason I started this review – THE FOOD! The vegan menu at the White Hart currently has three starters, five mains and three desserts (can be viewed online). 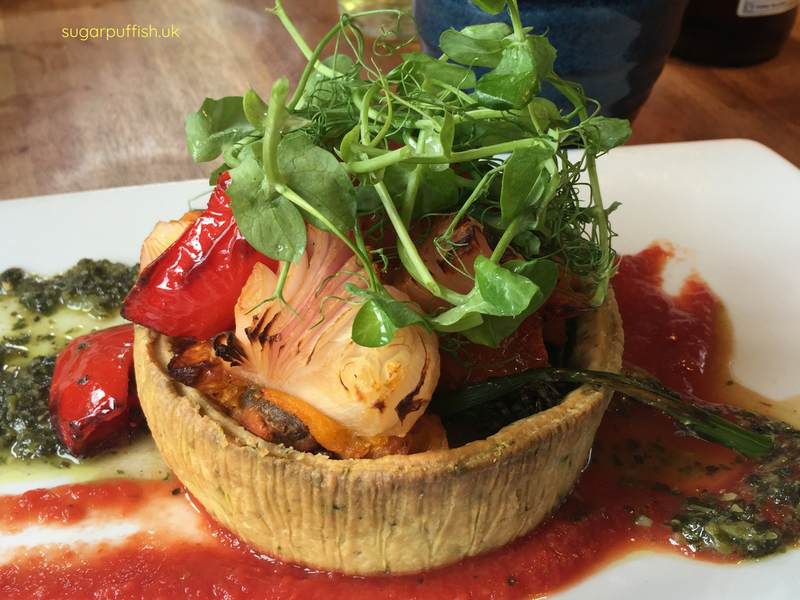 Since dessert options were available I skipped Starters and went straight for a main course of Roasted Butternut Squash & Sweet Potato Tart stuffed with roasted peppers, leeks, confit tomato and a leek sauce. It was not only beautifully presented but it was absolutely delicious. For me Vegan pastry is the ultimate tests for any Chef especially since I’ve experienced some disasters. 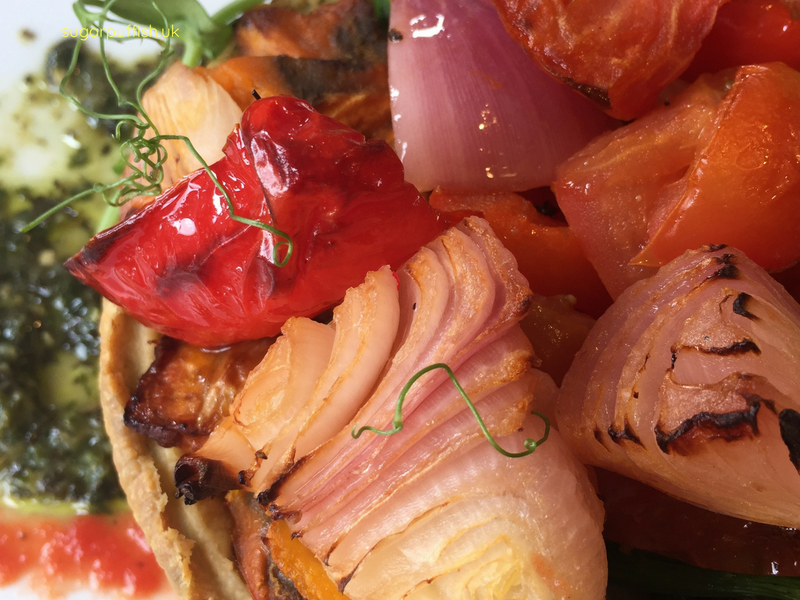 The pastry case was stuffed full of roasted vegetables sitting on a layer of leek sauce, it was accompanied by a small side salad (served separately). I assume the green sauce on the plate was a take on pesto and I actually uttered the words “are we sure this is Vegan?” For me I see that as a compliment when I have a moment of doubt because something tastes so good. I’d already chosen my dessert before my bum hit the seat in the restaurant. 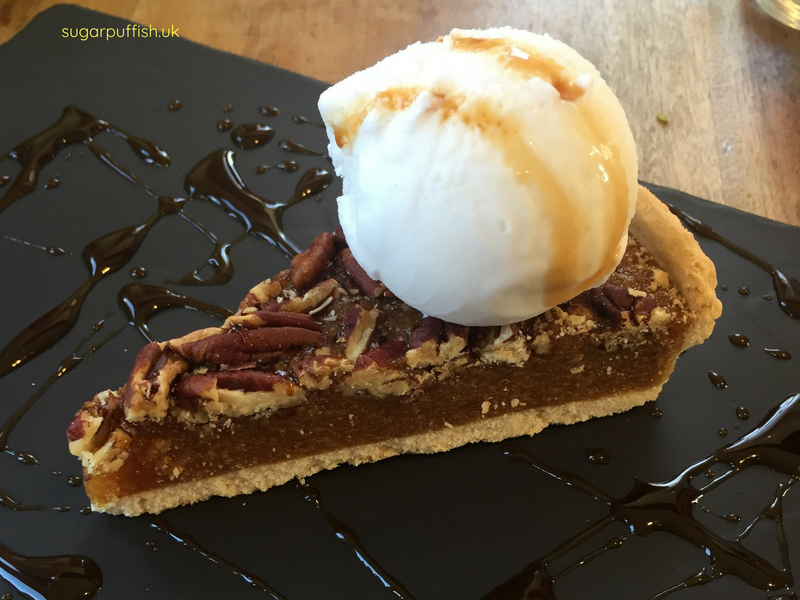 It had to be the Treacle and Pecan Tart. Oh my goodness it was delicious and brought back so many childhood memories. If I said to you that my ultimate pudding is Sticky Toffee then you might see the connection, I’m a lover of anything treacle and sugary. My Husband who had refused dessert (yes not sure why I married him ha!) suddenly started commenting on how good mine looked so I gave him the spoon (yes I am nice) he then declared his approval. The White Hart has certainly proven that fruit is not a pudding by providing desserts which even my non-Vegan husband would enjoy normally at any other restaurant. I commend the staff and venue for thinking about customers with dietary needs and executing it well and to a high standard. If you need allergen information ahead of your visit there is a link on the website. We’ll definitely return to the White Hart quicker than before as I’m now planning on working my way through the entire Vegan menu.